As with any easy brownie recipe, you can always skip a step or two and use a brownie mix instead of making it from scratch. But this recipe calls for just 8 ingredients. It’s well worth the extra minute or two needed to measure and mix this version from scratch. Heat oven to 350ºF. Line an 8-inch square baking pan with nonstick aluminum foil, allowing ends to drape over edges of the pan. Spray the pan liner with vegetable spray. Set the pan aside. Use an electric mixer on low speed to blend in granulated sugar, then eggs and vanilla. Stir in flour and salt until smooth. Fold in 2/3 cup of the chopped macadamia nuts and the vanilla. Transfer batter to prepared pan. Bake brownies for 25 to 29 minutes. Sprinkle remaining 1 cup chocolate chips over brownie and return the pan to oven for 2 minutes. Remove the pan from oven. Use an angled spatula or kitchen knife to spread melted chips until the surface is smooth. 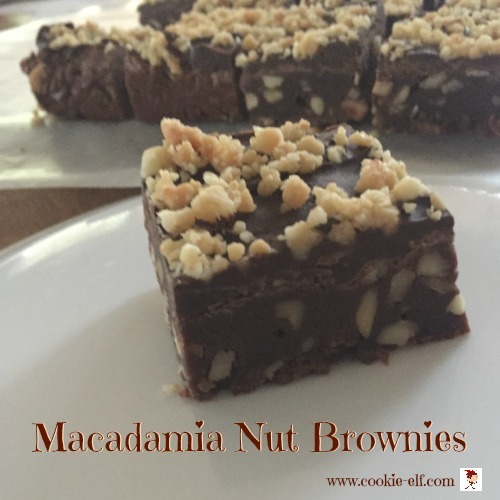 Sprinkle the chocolate with remaining macadamia nuts. Refrigerate 1 hour to allow brownies to set. Store brownies in an airtight containers in the refrigerator with waxed paper in between layers. Don’t over-chop macadamia nuts in the food processor, or you’ll get macadamia nut butter. Macadamia nuts have a high oil content which means they are very perishable. Store leftovers in an airtight container in the refrigerator.